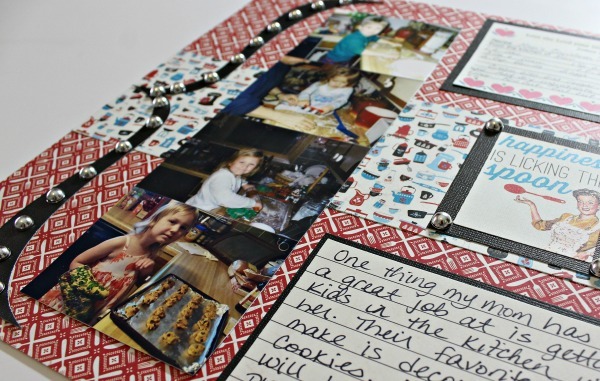 If you have never created a recipe card scrapbook layout you need to make one now. What a wonderful way to preserve those handwritten recipes! I was able to make this adorable layout using a monthly scrapbook kit! WHY MAKE A RECIPE CARD LAYOUT? 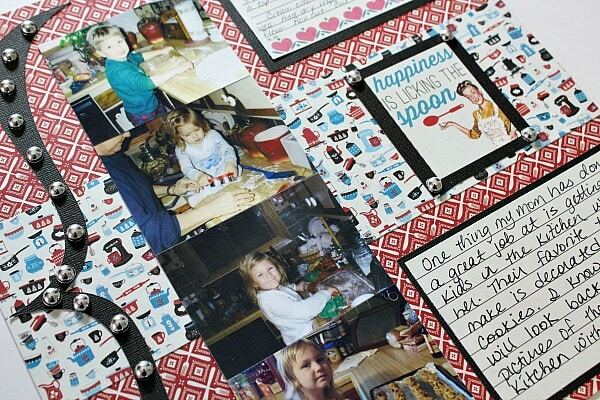 Putting recipe cards on a scrapbook layout isn't the most traditional form of scrapbooking. Luckily there are NO RULES when it comes to this amazing hobby. Scrapbooks are all about memories and preserving those memories that are dear to us. What could be more dear to us than family recipes? Especially if you have those recipes written by someone you love. Seeing that handwritten recipe will be something the family can cherish for years to come. It is also a fun way to scrapbook pictures of people in the kitchen! First off I want to thank ScrapbookingStore.com for sponsoring this recipe card scrapbook layout post and providing me their April 2019 monthly kit to make this project! I decided to make this a one page layout even though I had four pictures to put on the page. To solve the issue of too many pictures, too little space…which is a common problem for me…I printed the pictures off wallet size. I scanned the recipe card into my computer and then printed a copy off on cardstock. This way I still have the original recipe card in my recipe file box. The papers in the Authentique Ingredient Collection are so cute and would make some adorable gift tags for giving out with baked goods! This is a very easy scrapbook layout and won't take you long to make! Start off by printing your images and getting your recipe card ready to go. I wanted to use a really big bracket on the layout so I cut one out using my Cricut. The bracket was cut out of plain black cardstock and I cut it about 11.5 inches so that it would be almost as long as the page. Next up I took the red patterned fork and knife paper and that was the base of my layout. I cut the piece of white utensil paper so that I had a strip that was about 3.5 inches wide by 12 inches. I placed it across the center of the layout. The piece of Authentique cardstock that has recipe cards on one side and journaling lines on the other side worked perfectly for my journal box. This is also a great piece if you want to hand write the recipe on the recipe card side! For the journal card I just cut out a section from the lined side that was the same size as my recipe card. Next I cut mats out of the black cardstock for my recipe card and my journaling card and wrote my journaling. I wanted to have a picture of each one of my kids baking at their Grammy's house. These photos were printed off wallet size and I adhered them to a scrap of cardstock vertically for easy placement. 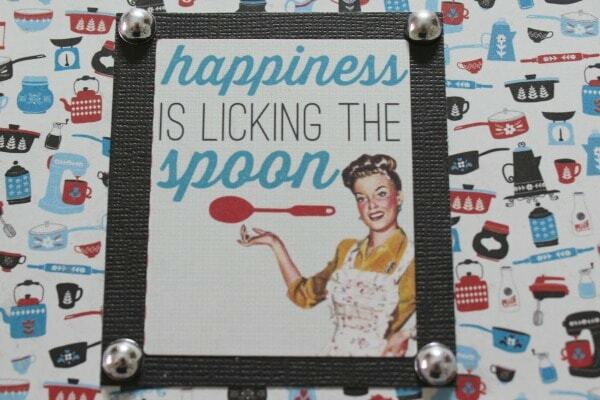 The “happiness is licking the spoon” sticker was placed on a small piece of black cardstock. I used the silver dot stickers from the kit and put them along the big bracket and the sticker mat. These remind me of the silver of cookie cutters!! Adhere all the parts of the layout and you are done! The great thing is that after finishing this layout I still have 95% of my kit left and I can make so many more projects! I love knowing I can complete a lot of projects with these super cheap scrapbooking supplies! Would you like to win a ScrapbookingStore.com monthly kit to try out yourself? You can enter below if you are 18 years old and live in the US. You can check out this Happy Day layout I made using a ScrapbookingStore.com kit. 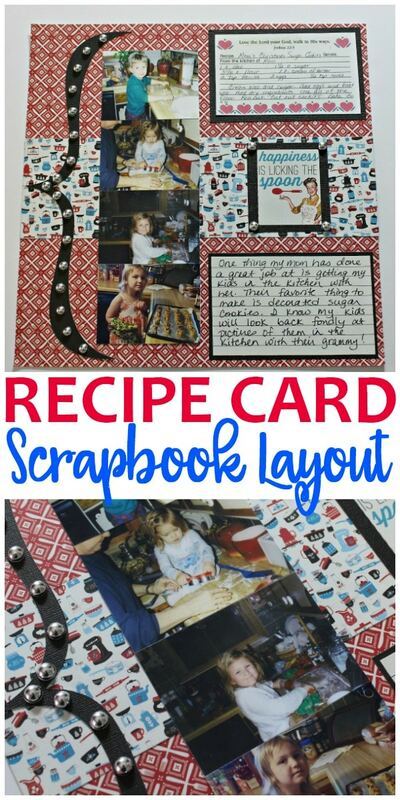 Don't forget to PIN this recipe card scrapbook layout please….and JOIN my scrapbook Facebook group right HERE! Wonderful layout Jamie! I love seeing family recipes preserved and memorialized like this!